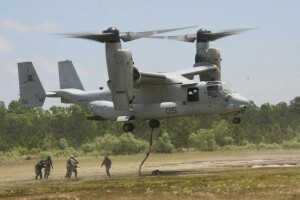 The U.S. is upping its commitment to the thus far unsuccessful search for Joseph Kony and his Lord’s Resistance Army by dispatching four Osprey Aircraft plus KC-130 transport and refueling tanker planes, and 150 Air Force Special Forces plus air crews to add to the 150 U.S. troops already based in Uganda for the search for the Lord’s Resistance Army in the Democratic Republic of the Congo, South Sudan, and the Central African Republic. President Obama has ordered a sharp increase in U.S. Special Forces deployed to Uganda and sent U.S. military aircraft there for the first time in the ongoing effort to hunt down warlord Joseph Kony across a broad swath of central Africa. At least four CV-22 Osprey aircraft will arrive in Uganda by midweek, along with refueling aircraft and about 150 Air Force Special Forces and other airmen to fly and maintain the planes, according to Amanda Dory, deputy assistant secretary of defense for African affairs…The new War Powers Act notification sets the approximate total for all U.S. forces in Uganda at 300.